Follow The Bleeder by sciTunes Available Now! — Welcome to the GameSalad forum! Follow The Bleeder by sciTunes Available Now! October 2011 edited 4:41AM in Announce Your Game! Can you trick the Zombies and make them Follow The Bleeder? Zombies love brains. If you want to keep your brain in this game you must lead up to three zombies to fresh corpses. If a zombie is eating a corpse's brain HE'S NOT EATING YOURS! You'll need to draw a path of fresh blood to lead the Zombies to the correct coffin containing a fresh corpse. 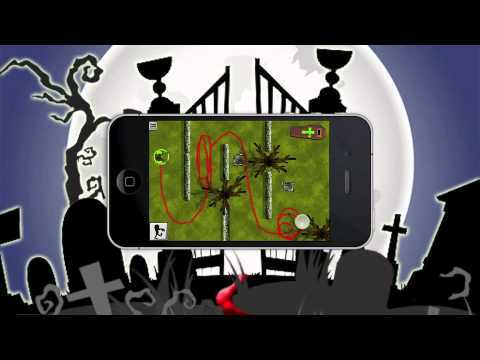 You'll need to plan a path that keeps your zombies from being run over by hearses, falling into open graves, and getting blown up by land mines, robotic mines, and heli-bombs, and all sorts of crazy obstacles! Oh, and Timing is everything! Simple, intuitive game play makes this Zombie Game Easy to Play and hard to put down. Simple one touch controls. Not so simple challenges. Intuitive user interface: Draw a path, if it does;t work out you simply undo your line and it "rewinds" until you reach the spot where you need to redraw it. Sometimes you may want to keep the same line and simply start your Zombies at different moment in time. You'll focus on the puzzles and not the interface. ...YOUR SURVIVAL DEPENDS ON IT!!!!!!! Haha awesome, I love the title. sounds like some clever game mechanics in there too with the undo levels etc. First off, I like your idea. Bought the game mostly because I'm working on a trace the alphabet game and was intrigued by the mechanics of the "follow the blood trail sysyem". LIke what you did! That said, the more games link didn't work, after which the game got stuck on the loading page. Had to power off my ipad (ios 5) to get game to work again. Anyone else have this happen to this or their games? Thanks for purchasing the game and for the kind review. The more games bug is probably due to the silly in app browser. GS really needs to give us an option with that. I will try to get an update out ASAP. Does anyone know of anyway to link to your other games with the new browser system?